The Afar (Afar: Qafár), also known as the Danakil, Adali and Odali, are an ethnic Cushitic peoples inhabiting the Horn of Africa. They primarily live in the Afar Region of Ethiopia and in northern Djibouti, although some also inhabit the southern point of Eritrea. Afars speak the Afar language, which is part of the Cushitic branch of the Afroasiatic family. Afar society has traditionally been organized into independent kingdoms, each ruled by its own Sultan. Among these were the Sultanate of Aussa, Sultanate of Girrifo, Sultanate of Dawe, Sultanate of Tadjourah, Sultanate of Rahaito, and Sultanate of Goobad. Territory of the Adal Sultanate and its vassal states (ca. 1500). The earliest surviving written mention of the Afar is from the 13th-century Andalusian writer Ibn Sa'id, who reported that they inhabited the area around the port of Suakin, as far south as Mandeb, near Zeila. They are mentioned intermittently in Ethiopian records, first as helping Emperor Amda Seyon in a campaign beyond the Awash River, then over a century later when they assisted Emperor Baeda Maryam when he campaigned against their neighbors the Dobe'a. 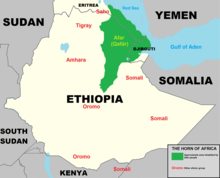 Along with the closely related Somali and other adjacent Afro-Asiatic-speaking Muslim peoples, the Afar are also associated with the medieval Adal Sultanate that controlled large parts of the northern Horn of Africa. During its existence, Adal had relations and engaged in trade with other polities in Northeast Africa, the Near East, Europe and South Asia. Many of the historic cities in the Horn region, such as Maduna, Abasa, Berbera, Zeila and Harar, flourished with courtyard houses, mosques, shrines, walled enclosures and cisterns during the kingdom's Golden Age. The Afar Sultanate (Aussa Sultanate) succeeded the earlier Imamate of Aussa. The latter polity had come into existence in 1577, when Muhammed Jasa moved his capital from Harar to Aussa with the split of the Adal Sultanate into Aussa and the Harari city-state. At some point after 1672, Aussa declined and temporarily came to an end in conjunction with Imam Umar Din bin Adam's recorded ascension to the throne. The Sultanate was subsequently re-established by Kedafu around the year 1734, and was thereafter ruled by his Mudaito Dynasty. The primary symbol of the Sultan was a silver baton, which was considered to have magical properties. Official flag of the Afar Revolutionary Democratic Unity Front. Following an unsuccessful rebellion led by the Afar Sultan, Alimirah Hanfare, the Afar Liberation Front was founded in 1975 to promote the interests of the Afar people. Sultan Hanfadhe was shortly afterwards exiled to Saudi Arabia. Ethiopia's then-ruling communist Derg regime later established the Autonomous Region of Assab (now called Aseb and located in Eritrea), although low level insurrection continued until the early 1990s. In Djibouti, a similar movement simmered throughout the 1980s, eventually culminating in the Afar Insurgency in 1991. After the fall of the Derg that same year, Sultan Hanfadhe returned from exile. In March 1993, the Afar Revolutionary Democratic Front (ARDUF) was established. It constituted a coalition of three Afar organizations: the Afar Revolutionary Democratic Unity Union (ARDUU), founded in 1991 and led by Mohamooda Gaas (or Gaaz); the Afar Ummatah Demokrasiyyoh Focca (AUDF); and the Afar Revolutionary Forces (ARF). A political party, it aims to protect Afar interests. As of 2012, the ARDUF is part of the United Ethiopian Democratic Forces (UEDF) coalition opposition party. Approximate area inhabited by the Afar ethnic group. The Afar principally reside in the Danakil Desert in the Afar Region of Ethiopia, as well as in Eritrea and Djibouti. They number 1,276,867 people in Ethiopia (or 1.73% of the total population), of whom 105,551 are urban inhabitants, according to the most recent census (2007). The Afar make up over a third of the population of Djibouti, and are one of the nine recognized ethnic divisions (kililoch) of Ethiopia. Afars speak the Afar language as a mother tongue. It is part of the Cushitic branch of the Afroasiatic language family. The Afar language is spoken by ethnic Afars in the Afar Region of Ethiopia, as well as in southern Eritrea and northern Djibouti. However, since the Afar are traditionally nomadic herders, Afar speakers may be found further afield. Together, with the Saho language, Afar constitutes the Saho–Afar dialect cluster. Afar people are predominantly Muslim. They have a long association with Islam through the various local Muslim polities and practice the sunni form of islam. Afar man in traditional nomadic attire. The Afar are traditionally pastoralists, raising goats, sheep, and cattle in the desert. Socially, they are organized into clan families and two main classes: the asaimara ('reds') who are the dominant class politically, and the adoimara ('whites') who are a working class and are found in the Mabla Mountains. In addition, the Afar are reputed for their martial prowess. Men traditionally sport the jile, a famous curved knife. They also have an extensive repertoire of battle songs. ^ "Central Statistical Agency of Ethiopia (CSA) - 2017". Central Statistical Agency of Ethiopia (CSA). Archived from the original on 8 November 2017. Retrieved 24 May 2018. ^ a b "Afar". Ethnologue. Retrieved 8 November 2016. ^ a b c d Matt Phillips, Jean-Bernard Carillet, Lonely Planet Ethiopia and Eritrea, (Lonely Planet: 2006), p. 301. ^ Pankhurst, Borderlands, pp. 61-67, 106f. ^ Ethiopia - Political Parties, Accessed: 1-07-2006. ^ "Country level" Archived 16 August 2010 at the Wayback Machine, Table 3.1, p.73. ^ "The World Factbook — Central Intelligence Agency". www.cia.gov. Retrieved 2018-04-10. ^ Uhlig, Siegbert (2003). Encyclopaedia Aethiopica: A-C. Otto Harrassowitz Verlag. pp. 103–. ISBN 978-3-447-04746-3. Retrieved 30 May 2011. Jeangene Vilmer, Jean-Baptiste; Gouery, Franck (2011). Les Afars d'Éthiopie. Dans l'enfer du Danakil. ISBN 9782352701088. Archived from the original on 31 July 2013. Wikimedia Commons has media related to Afar people.